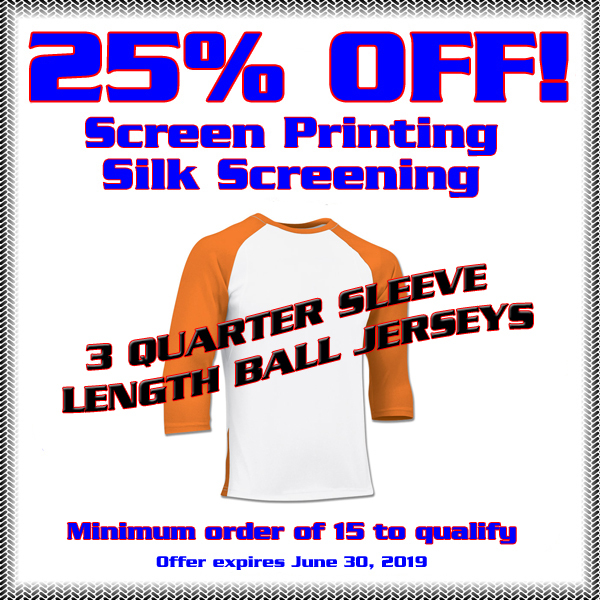 Print out or simply refer to the following coupon for a terrific saving of 25% OFF ANY Screen Printing Regina or Silk Screening Regina order of 15 or more custom 3/4 sleeve length baseball shirt jerseys! Easily custom design your own team baseball shirts in our FREE, simple to use online design studio. Screen Printing Regina or Silk Screening Regina can help you with your custom t shirts or other custom imprintable items such as custom baseball shirts, baseball tees, baseball jerseys, custom team shirts, custom team jerseys, custom sports shirts, custom sports jerseys, custom rec league shirts, custom rec league jerseys, and more. Get your baseball or sports team spiffed up in some custom made t-shirts! 25% OFF!!! Phone or E-mail Regina T Shirts to ask us what we can do for you. 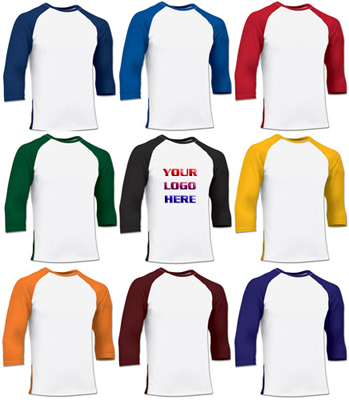 Colour quantities are solely determined by yourself for each baseball jersey custom t shirts order. Individualized names and numbers may be included on your personalized baseball shirts. NOTE: Minimum order of 15 items for this Screen Printing Regina & Silk Screening Regina online coupon regarding custom 3/4 sleeve length baseball shirts. Screen printing and silk screening for promoting your team! Screen printing and silk screened t-shirts are an ideal way for you to promote your team, yourself, your school, your organization, your club and your group. Screen printing and silk screening is an inexpensive solution for you to custom design your own team jerseys on inexpensive t-shirts. You'd be surprised how easy it is to do! Be proud of your team! Try Screen Printing Regina today! Screen Printing Regina and Silk Screening Regina has an answer for all of your custom screen printing and custom silk screening needs. Promote your team! Design YOUR OWN spiffy baseball shirt jerseys. It's so easy. Anyone can do it! And best of all, with this offer, it's VERY inexpensive! 1. After you've created your special image or had your image designed for yourself, you can utilize our FREE ONLINE DESIGN STUDIO. You'll simply need to upload your image following our easy to follow instructions. 2. Select your garment, in this case the 3/4 length t-shirts, from the large apparel selection Screen Printing Regina has. 3. Then in a simple step by step process, begin your online design for your baseball team's custom t shirts. After your image/logo is uploaded, our studio will easily allow you to place your design/logo on the garment of your selected choice. Then get ready to SAVE 25% on your Regina screen printing or Regina silk screening order for your baseball shirts. 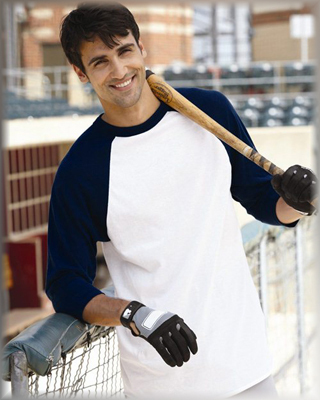 We have done baseball shirt jerseys for countless teams, all to their satisfaction. Or simply contact us. Send us your image either by e-mail or even regular mail if you wish and this 25% off screen printing and silk screen printing coupon for your team's baseball jersey custom t-shirts. Simply referring to this "25% OFF" Screen Printing Regina coupon will also suffice. You can also bring your image you'd like to have screen printed or silk screened down to us if you can make it to our location in Regina, Saskatchewan. We'll take it from there. *NOTE: With this coupon offer however, only a minimum order of 15 or more custom 3/4 sleeve length baseball jerseys may qualify. Regina T Shirts does custom baseball shirts, baseball jerseys, custom ball jerseys, baseball t-shirts, ball shirts, custom baseball team tshirts, and more. Regina T Shirts specializes in screen printing, silk screen, silk screening, silk screen printing, silkscreening, Regina screen printing, Regina silk screening, Regina t shirt printing, Regina t shirt design, screen printing Regina, silk screening Regina, t shirt printing, . We also specialize in t shirt design, custom t shirts, custom t shirts Regina, Regina custom t shirts, tshirt printing, t-shirts Regina, custom shirts, Regina custom shirts, Regina t-shirts, custom shirts Regina, shirts Regina, Regina shirts, online printing, and Regina screen print services. Regina t-shirts also specialize in shirt printing, design your own t-shirt, t-shirts, make your own t shirt, Regina printed t shirts and online t shirt design in Regina & area.